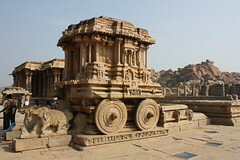 Hampi was the political capital of the Vijayanagara empire. The village still preserves the ruins of the old glorious days under the Vijayanagara kings. Situated on the banks of Tungabhadra river Hampi is one among the places that entered the UNESCO World Heritage List. At Hampi you can find a lot of temples with Virupaksha Temple and Vittala Temple being the prominent ones. The Stone Chariot near the Vittala Temple is a magnificent display of rockart. Out of the numerous rock carved statues at Hampi the Yoga Narasimha Statue is the finest one. Hampi or the " City of ruins"is near to the Tungabhadra Dam. Visiting Hampi during the winter season of September to January will be good as it will be green during that time. During the summer months the place goes dry. Being a well known tourist place Hampi has enough number of hotels. Below is a list of some of them:Hotel Mayura Bhuvaneswri ph:08394-241574. Hotel Malligi ph:08394-228101. Hotel Mayura Lodge ph:08394-222080. Hotel Priyadarshini ph:08394-225938. Ranjana Guest House ph:08394-241 696. Hotel Shanbhag Towers ph:08394-225910 - 225917. Hampi is 355km from Bangalore. Route 1: Bangalore - Tumkur - Sira - Hiriyur - Chitradurga - Kudligi - Hospet - Hampi. KSRTC runs only one Rajahamsa to Hampi from Bangalore. One can easily reach Hospet by direct KSRTC or Railway services from Bangalore. From Hospet KSRTC connection buses are easily available.